Momaholic is not quite what I expected. Perhaps it was the cover that lead me to believe it was a comedy. It is anything but a comedy. This is a story showing the speed with which a “normal” family can fall apart. No one dies. No one gets kidnapped. They just have to deal with each of their own issues….and then one unwanted and unplanned pregnancy. This was a church-going family whose kids were taught abstinence until marriage. With the family running around as the tornado sirens roared warnings to take cover, mother, Miss Drama, becomes the biggest mess of all and ends up finding a whole new freedom for her soul. Many times I found myself nodding in agreement with Dena and then crying from understanding her pain. Life can throw some difficult things at us and Dena surely had her fair share. This book is a beautiful story of a courageous woman who tries to find and keep the the balance in her life. Dena’s writing style is very conversational which makes this book a quick read. I see it as her story more than a ‘how to’ book as she doesn’t actually offer any keys to finding and keeping the balance in life. 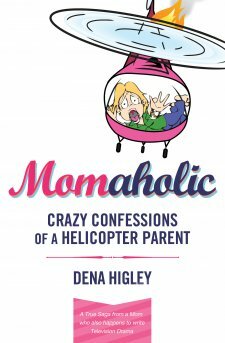 Thank you to Thomas Nelson for providing me with Momaholic for review. I thoroughly enjoyed it.